Are you the person who won Tuesday night's $1.6 billion Mega Millions drawing? If so, kudos for reading this instead of prepping for your new Scrooge McDuck-style money pool (though really, you should probably be figuring a few other things out first). However, odds are extremely high that, like the millions of other people who bought a ticket, you woke up this morning no richer than before. 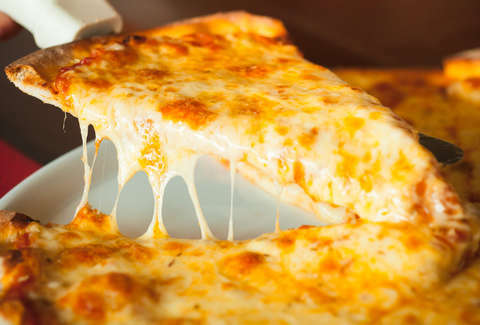 To soften the blow, you might at least be able to score a free lunch out of your loss because a nationwide pizza chain is handing out free slices today to anyone who can prove they didn't win. Villa Italian Kitchen, the New Jersey-based pizza chain with roughly 250 locations across the country, is offering a deal for anyone who shows up on Wednesday, October 24 with a losing Mega Millions ticket from Tuesday night's drawing. To get in on it, you just have to fork over your now worthless piece of paper and they'll give you a free slice of cheese pizza (with the purchase of a beverage). So, yes, this isn't an entirely free giveaway, but a bonus slice of pizza is certainly better than getting nothing in exchange for the $2 you paid to throw your hat in the lottery. Before you scurry off to your closest VIK, though, there are some details to consider. The promotion is only valid at participating locations and you absolutely have to have a ticket, dated with Tuesday's drawing, with you. Oh, and it also must be a losing ticket, so, sorry newly-minted billionaires, looks like you'll be forced to pay for yours.